A month has passed since Iraqi forces began to push ISIS out of west Mosul. 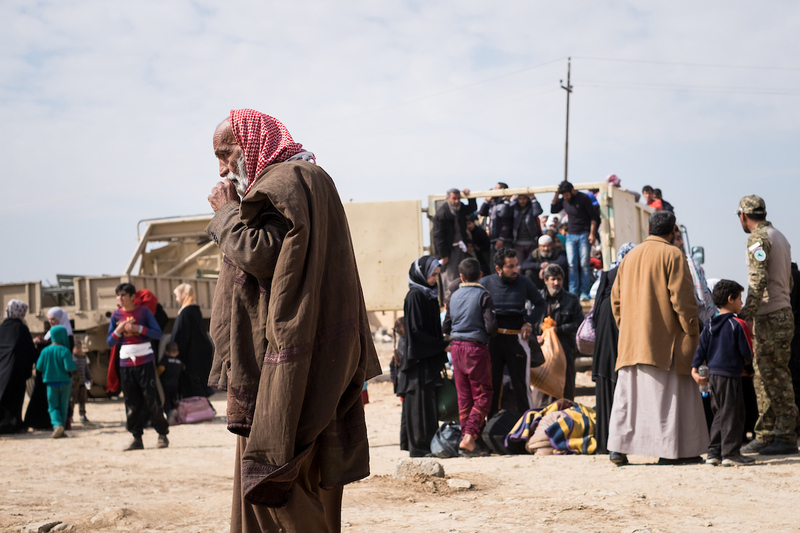 ISIS appears to be becoming increasingly desperate, fighting to the death with no regard for civilian lives or property—and no apparent escape routes. One Mosul local described what ISIS fighters were doing as a “scorched earth policy.” They have not launched any successful attacks, they were shelling indiscriminately, bombing areas that were no longer under their control, and were basically trapped, he said. Fighting in west Mosul was always going to be more difficult. The population density is higher in this part of the city, and houses are built close to one another in neighborhoods that won’t allow larger vehicles like tanks or armored vehicles to pass easily. On the eastern side of the city, ISIS used a lot of car bombs, driven by suicide bombers. The cars would be driven to obstruct Iraqi troops from getting closer to ISIS fighters, or to trap them. Shaghati says an estimated 850 exploding cars were used against them on that side of the city. However, very few car bombs are being used on the western side. For one thing, the streets are too narrow for anything other than restricted movements, and there has also been an increase in air cover for the pro-government forces. On the western side of Mosul, ISIS has been deploying snipers, many of them from Russia or other central Asian countries, according to locals caught in the fighting. Fighters bearing light to medium weaponry and suicide bombers with explosive belts have been moving quickly through and around the crowded housing. This kind of action was planned in advance. ISIS instructed local homeowners to make holes in their walls, more than three feet high and wide. This allowed fighters to move from house to house without being detected. Saad Agha,* a resident of the New Mosul neighborhood, which was freed from ISIS control a week ago,reported that he had refused to make a hole in his wall. Angry ISIS fighters gave him an hour to make the required hole or they would blow up his house. The holes were used by the IS fighters to escape and eventually also by the counter-terrorism troops, Agha recounts. “The Iraqi soldiers also came through these holes and told us that we are free,” he says. ISIS fighters had also told civilians to park their cars on the streets so that they could use them as barriers and impede the troops advancing. When pro-government forces get close to a vehicular blockade, the IS members set the cars on fire, in order to obscure the vision of aircraft that might target them. There are hundreds of burned out cars all through the areas that the IS group has been expelled from. Ahmad Saeed*, a local of the Risalah neighbourhood which the pro-government forces reached just a few days ago, told NIQASH how his family’s vehicles were destroyed. “This dirty person came to our house and asked us to give us some fuel. He then started to pour it on our cars and our neighbors’ cars and then set them alight,” Saeed says angrily. The corpse of the fighter in question now lies on the street. When ISIS realizes it’s about to lose control of an area, it starts forcing locals to move into other areas with them, in order to use them as human shields. Thousands of people have been moved into mosques, schools, and health centers in the old city in west Mosul. In a telephone conversation, Um Amar* saids ISIS forced her family to take in another family from the neighborhood . “And this is just one family they have brought from the southern neighborhoods against their will,” she says. “There are hundreds more. Each house in our area now has more than ten people living there, and we do not have enough to eat or drink,” she adds fearfully. Some civilians have tried to escape this fate. But it is very difficult to get out of ISIS-controlled areas and into the pro-government-held parts of the city; there is no established safe route. A local man named Abdul Samir* and his family of six tried to escape but were caught. But to what kind of fate, Samir does not know. “They brought us back to the caliphate, so I guess we must stay here—in this house, in the middle of this war. All I can do is put one hand on my head to protect myself from the bombs falling, and the other hand on my stomach, to protect me from starvation. I know that either we will die here or we will be free,” he said, shortly before starting to cry and hanging up. This article originally appeared on Niqash.org. Reposted with permission.